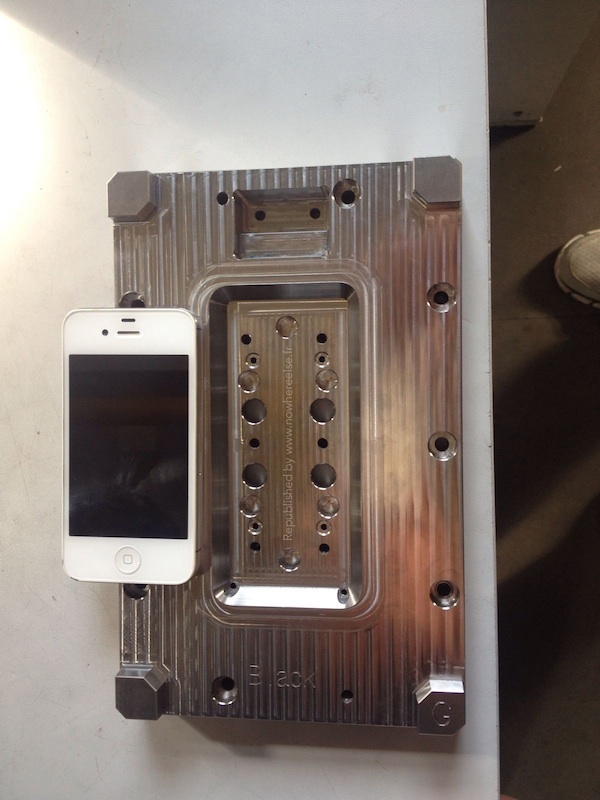 Over the weekend, several photos surfaced reportedly showing details on manufacturing molds for the iPhone 6. 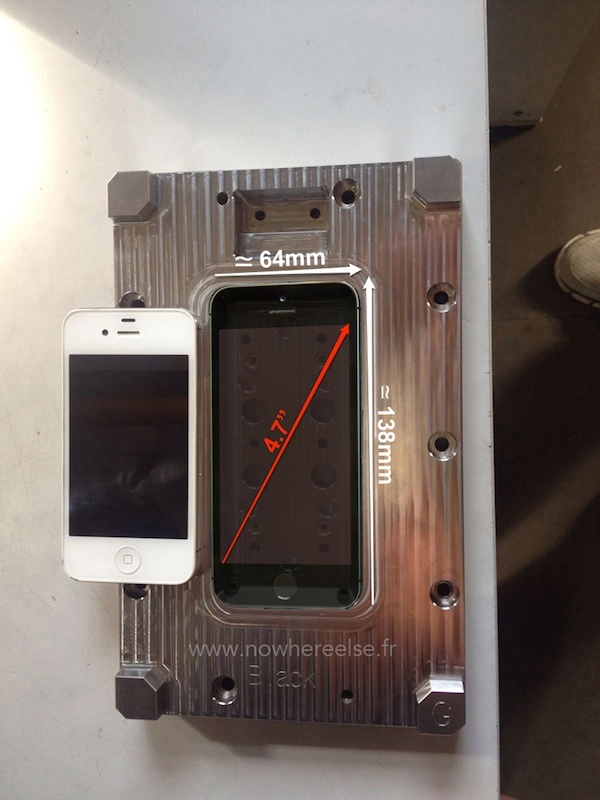 While the manufacturing mold photos left it unclear as to the size of the device body it would yield, a new photo shared by Nowhereelse.fr [Google Translate] shows a nearly identical mold with an iPhone 4s placed next to it for comparison. Calculations based on the comparison suggest that the mold could in fact yield a device with a display of roughly 4.7 inches, in line with the rumored size for the smaller of the two iPhone 6 models. One source of uncertainty lies in the shape of the mold, which is tapered. But Nowhereelse.fr believes that there are additional pieces yet to be attached to the bottom of the mold, pieces which would result in the iPhone's body being formed at the wider portion of the mold depression. Some of the holes that were drilled into the block in fact serve to fix the inserts which will form a crude which is then machined housing (finishes) using a CNC milling machine. Thus, and assuming that my theory is correct, the dimensions of the box will be determined by the widest part and not the bottom of the mold. In this assumption, I started to resize the photo to scale against me in reference to the size of the iPhone 4s. I then measured the dimensions of the widest part of the mold which is approximately 138mm long by 64mm wide. By superimposing and resizing an iPhone 5s image into the mold and aligning it with the wider portion of the depression, Nowhereelse.fr determines that the device's screen would be roughly 12 centimeters or 4.7 inches diagonally. Apple's iPhone 6 is expected to launch later this year, with the 4.7-inch model perhaps preceding an even larger 5.5-inch model by a few months. Jefferies analyst Peter Misek today reported that Apple is negotiating with carriers for a $100 price increase on the iPhone 6 as the device gets larger and the company packs more technology into it. Fake. Photo isn't grainy enough. So much for "doubling down" on security Tim. Lol havent heard this one before. why couldn't it be compared next to, i don't know.. an iPhone 5/5s? Why such dramatic swings of faux annoyance and so much drama-queening? You guys are saps - wait for the launch, and stop pretending to suddenly know all about manufacturing processes; you get yourselves all carried away on tides of emotion... and for what - a "leaked" photo of something with no foundation of proof? PS: Next person to think themselves amusing with the "doubling down" nonsense gets a smack round the head with a wet kipper. If you have such little faith in Apple's design prowess, why are you still coming to an Apple-biased forum?